Steed and Emma float away in a hot-air balloon. "Where have all the martlets gone?" This query from a birdwatcher sends our duo searching for a deadly chemical that may have gotten into the wrong hands—specifically those of a "huntin', shootin', fishin', sittin' on every committee" slimeball who has cut a deal with a curious assortment of greedy locals to bring the government to its knees by defoliating the countryside. As Steed tells Emma, "Don't confuse me with the facts." This outdoorsy outing loses points for unevenness and a tendency to drag, and the villains are not particularly interesting—with the possible exception of Juggins the pig-killer. Plus it features the most unimaginative teaser of the series: little more than stuffed birds (and some fruit bats, according to Tony McKay) being dropped on the ground. Still, there are a number of worthwhile bits: Emma's opinion of Omrod, as expressed to Steed in the pub, is a right giggle and I love how Steed keeps his wine cool. 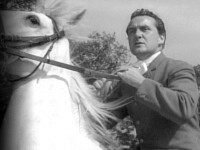 Steed and Dr. Fellows exchange some great lines, and the foxhunting protesters at the end add a cute touch. As a follow-up note, my opinion of this episode has softened somewhat (hence the added half-bowler) with the release of the A&E videos, as many wonderful little bits were cut from the "uncut" off-air version I had recorded back in the 80s. Sadly, they were not enough to compensate for the episode's shortcomings, but they did make the hour pass more enjoyably. The Stirrup Cup Inn was actually Well End Lodge, Well End. Deeves Hall Lane makes another appearance. And Tyke's Water Lake, Elstree, was used yet again—On Location provides a present-day view. 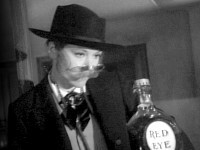 Steed has a bizarre delusion of Emma being an old-west doc as she removes a bullet (see the first grab). 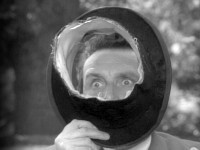 Steed spots Miss Snow entering the pub and tells Emma, "I'll see what I can pick up here." And Emma quips, "I'm sure you will... pick up something."